Tourism is helping save wildlife. That’s what we’re told. If this is true, where you spend your next holiday could be the most important decision you make, the world is counting on you. A family trip to Sea World…if you haven’t seen Blackfish, please watch. Psychosis, food depravity, stolen from their families is just a part of the torture the Orcas are subjected to. Bottom line: please educate yourself on where you’re going. If something doesn’t seem natural for an animal, it’s probably not! Don’t give your hard earned money to people who torture or enslave them. My trip to Kenya is fast approaching. . . But what I don’t have ready is my mindset. I know it will be what I imagine, and probably more. Yet, what’s on my mind, as it is everyday, is poaching. In a previous close encounter, a tour guide ran into just such an occurrence (see previous post Tour Guide Gives Eye-Opening Safari). What would I do stumbling across poachers at work? I know it’s not common. Most of them are not so brazen. They prefer the cover of night, to slink through the darkness like the snakes they are. But it’s a haunting scenario none-the-less. I do not fear for my safety, I fear the lack of power or control over stopping it. Even as the tour guide told his story, I felt a surge of rage cloud my brain, imagining myself jumping out of the vehicle charging at the poachers. Logical? Probably not. But I can fully empathize with the feelings of helplessness and frustration the tour guides, game rangers, and everyone working to protect the rhinos and elephants must feel on a daily basis. Finding a poached carcass is bad enough. Knowing it happened, the animal suffered, the bad guy won..utter heartbreak. But catching them in the act?! The trip agenda? Game drives, the Masai Mara, Ol’Pejeta, Samburu Reserve, meeting new friends and LOTS of photos to share with you all when I get back. Being on guided tours, things are well planned and prepared, unlikely to turn into a full-scale wilderness adventure. Yet on every trip there is a smattering of the unforeseen. 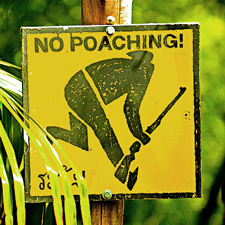 Who knows, if a poacher and I happen to cross paths…look out! Because while, most of my friends’ daydreams consist of winning the lottery, mine is taking out poachers. ….. Rhino Girl…standing in the savanna, cape blowing back in the breeze, ready to swoop in and rescue the rhino from poachers lurking in the shadows! 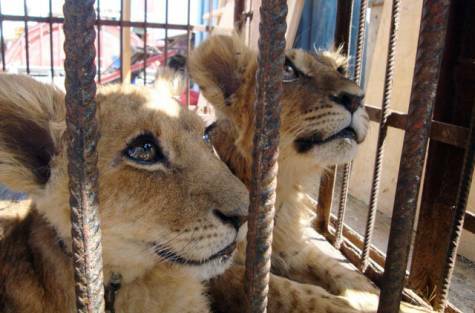 Lions await their fate at breeding farms. 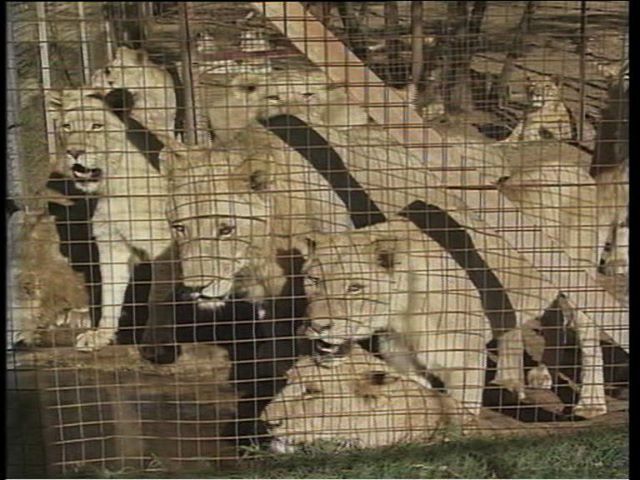 Recently SABC: Special Assignment aired an expose on lion breeding facilities in South Africa. The lioness’ are forced to breed more repetitively, not unlike puppy mills. They make money by tempting tourists to pay for being a “caregiver” to the cubs, leading them to believe they are helping with conservation of the lion. In reality these same cubs who become accustomed to people, are sold to the highest bidder to be shot and killed. This is an eye-opening, must-see for everyone concerned with animal conservation. Cubs start their lives off being doted on by well-meaning tourists. Ultimately they are all shot and killed by humans who they do not fear. Vacation time! 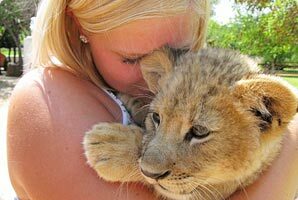 Animal lovers the world over choose their travel destinations to include up-close and personal wildlife experiences. There are plenty of options. Today it is important more than ever to be educated and vigilant about what our tourism money is funding. 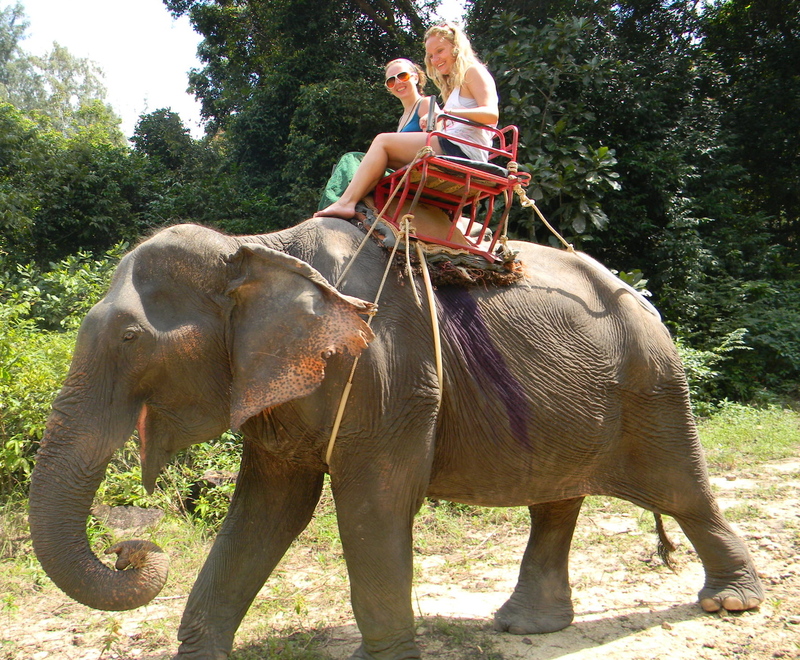 Thailand- Tourists come to Thailand for the opportunity of close encounters with the elephants. Cute baby elephants on the beach, riding elephants through the trees, getting photos taken with them for vacation memories to display on the mantel at home. Yet this image of the gentle giants is cruelly deceptive. Some places even hide behind the guise of being sanctuaries or conservancies leaving people with the impression they are in fact helping the animals. The Thai tourism industry is actually fueling the illegal trade in baby elephants and is responsible for the death and diminishing numbers of their species. Taken from the wild in Burma, they are beaten, starved and tortured with the intention of breaking their spirits in order to remain docile for the tourists. At least 50-100 babies are ripped away from their families every year. It is estimated that for every calf taken, there are 5 adult females and adolescent elephants from the baby’s immediate family who are slaughtered-gunned down in cold blood-so the baby can be easily taken. They are “trained” to “play” with the tourists on the beach or in the water, provide rides, perform tricks, and are even dressed in ridiculous outfits to humanize them. This takes place in resorts. 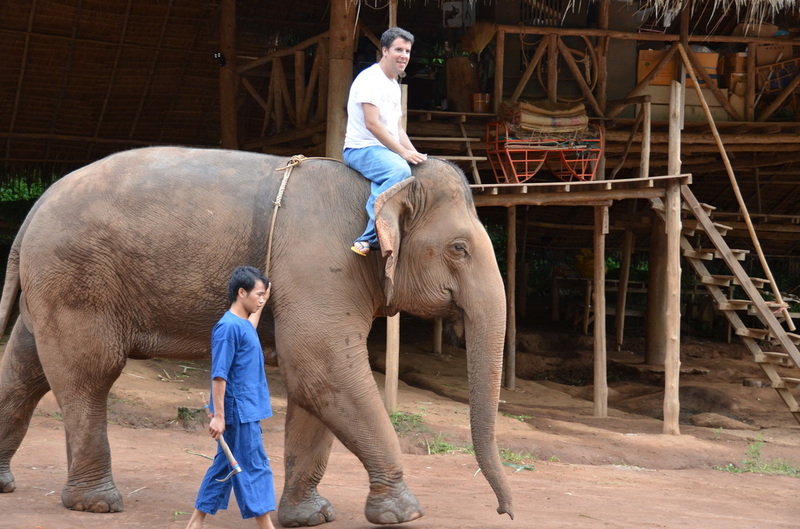 One resort “The Golden Triangle Elephant Camp and Resort” who claims to help with elephant conservation, advertises the opportunity to learn to “drive” an elephant or for a little extra you can learn how to be a mahout trainee and command them. 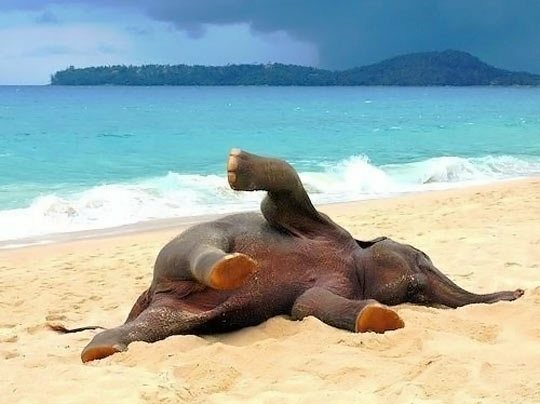 Then there’s always elephant yoga. It’s not just the resorts. Babies are also being used by individuals in the city. They are forced by their owners to live and work in an urban environment, roaming the streets begging tourists for money. They teach the babies tricks, give photo opportunities, and even sell over priced fruit to passers-by so they may feed the animals. Elephants are not designed for concrete jungles. This is why in zoos and in the situation of city living, they suffer from foot problems, sunstroke, dehydration, gastric and respiratory problems. In addition, there is always the complication of traffic; at one point there were up to 20 elephants a month being involved in traffic accidents. There are many who simply collapse on the street, and one even fell into a manhole. So how do you know if a resort is safe or animal friendly? 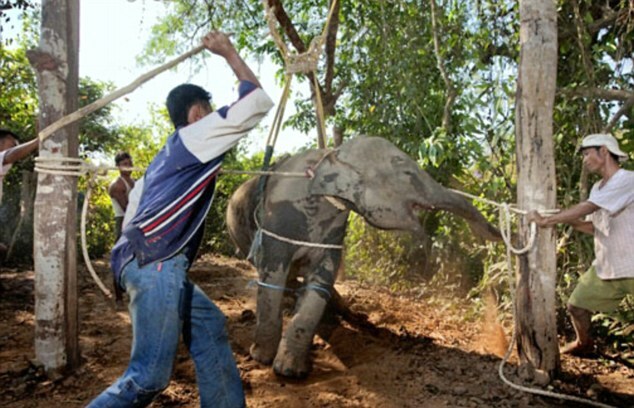 Bottom line-if what the elephants are doing is not something they do in the wild, it’s wrong. They do not provide rides for anyone, or paint or do tricks or pose for photos. By giving these people your money, you might as well be holding the bullhook that beats the animals into submission. Please be aware of where you go and keep the elephants safe. 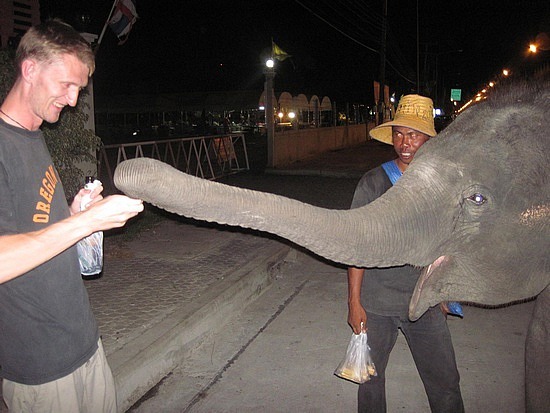 Typical elephant training to break their spirits and “tame” them. How far would you go to help your neighborhood? What would you do to protect it? In the US we have “neighborhood watches” for that very purpose. In northern Kenya, they have a watch group- a grass-roots squad of rangers formed to protect the elephants and rhino from poachers. Essentially a conservation militia, these volunteer villagers are fed up and taking matters into their own hands. 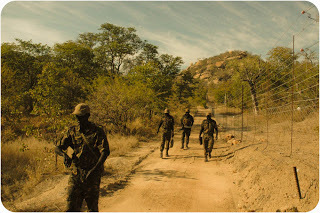 The ordinary citizens are arming themselves and taking to the bush to fight back. Not necessarily out of a “Have you hugged an elephant today?” attitude, but to protect the money the elephant (and rhino) bring to their villages. The safari/tourist industry is a successful and integral money-maker for Kenyans. An economic staple, tourists bring in more than a billion dollars a year. Much of that money is contractually bound to go directly to impoverished local communities, which use it for everything from pumping water to college scholarships. 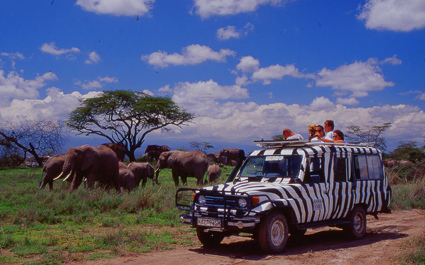 The safari industry also provides 500,000 jobs for the community; everything from cooks to safari guides to accountants. Contrary to the general belief the safari jobs can pay quite well. 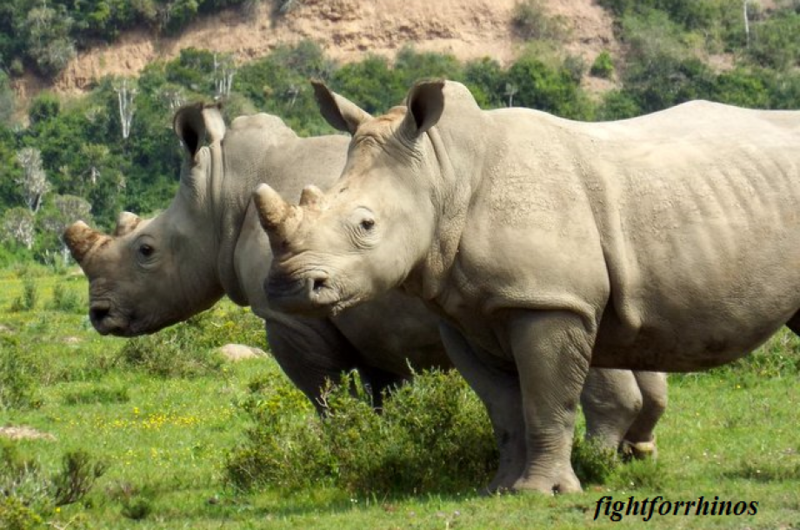 In addition to the poachers “robbing” the community of its wildlife, villagers are also turning against them because the illegal wildlife trade fuels crime, corruption, instability in the community. Here in northern Kenya, poachers are diversifying into stealing livestock, printing counterfeit money and sometimes holding up tourists. Some are even buying assault rifles used in ethnic conflicts. 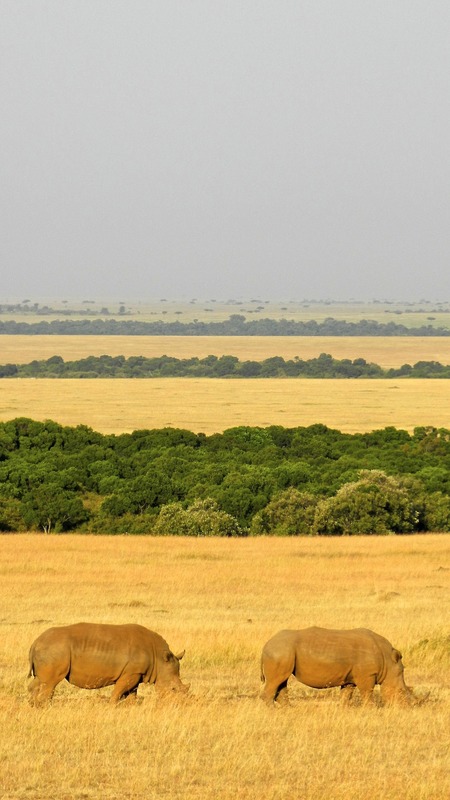 Is this key to future conservation efforts? Nothing else seems to be working. Everything from high tech drones and military deployment to removing or poisoning horns and tusks is being tried; yet poaching rates are still soaring. 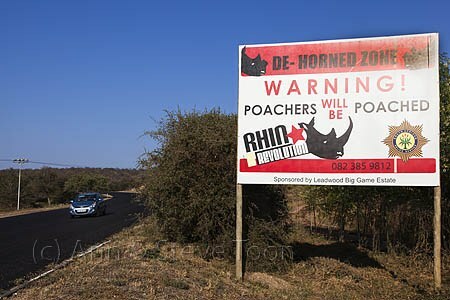 Perhaps with the local people appreciating and protecting their wildlife, the elephant and rhino still stand a chance. *”Phayru was a very gracious Tiger. He would chuff and lovingly greet most people in spite of his obvious suffering. I watched this tiger try so hard to be exceptionally well behaved for the TSW, and just as I smiled with adoration at his behavior, the remorseless pain of shock and horror gripped my heart again as another violent scene began to play out before my eyes. The Buddhist religion has long been known for enlightenment and peace. The “live and let live” mentality, never killing or hurting another sentient being, the theme of reincarnation and karma is familiar. Of course like most religions, there is contradiction. In Kanchanaburi, Thailand is the Buddhist temple better known as the “Tiger Temple”. Here the monks “bread and butter” comes from there supposedly peaceful relationship with the tigers. 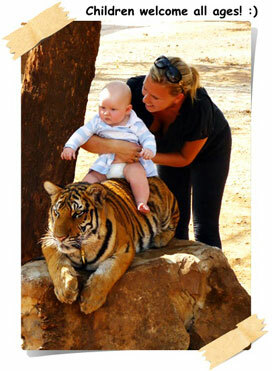 For twenty bucks, the tourists can have their picture taken next to a “tame” tiger. For a little extra, you can sit on the tiger’s back for the photo. Are they “tame”? Of course not. They are chained up, and although not proven, suspicion is they are drugged. They are seemingly very sedate, low energy, and depressed. Even if drugs were not used, their care is questionable. 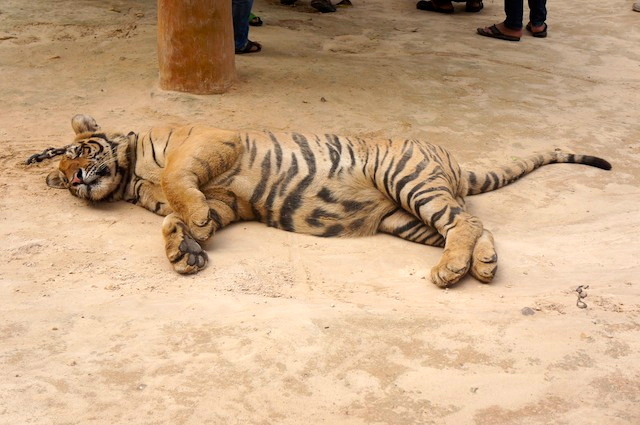 Although the Tiger Temple may have begun as a rescue centre for tigers, it has become a breeding centre to produce and keep tigers solely for the tourists and therefore the Temple’s benefit. 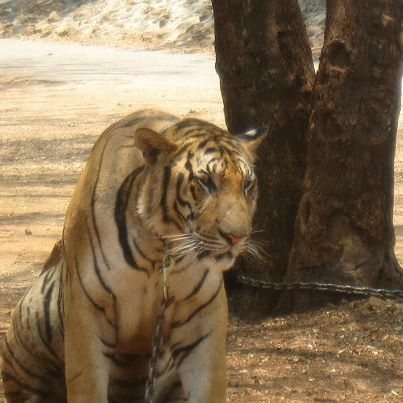 Illegal international trafficking helps to maintain the Temples’ captive tiger population. 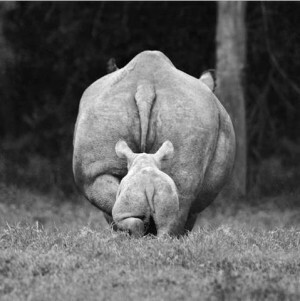 There is no possibility of the Temples’ breeding programme contributing to the conservation of the species in the wild.. The report also writes the tigers are at risk of malnourishment and are routinely handled too roughly by staff. The temple has denied wrongdoing or mistreatment of the animals. It’s estimated that a century ago there were over 100,000 tigers in the world. Today the population has dwindled to between 3,000 and 3,500 – a decline of over 95 per cent. The Tiger trade is a lucrative business and the Temple is a part of it. Be aware when you travel. Educate yourself, and if you are visiting an area where animals are present, question how they’re treated. Your tourist dollars could well be the difference between their benefit and detriment.